Miners during the early Gold Rush years wanted only one thing: gold. They didn’t care about elegance, craft or aesthetics. Greedy and in a hurry, they made do with simple yet effective tools. The gold panner patiently crouching alongside a river is symbolic of the Gold Rush, and yet gold pans were probably the most ineffective of all the miner’s tools, even though that is what most miners used early on. As word leaked out in 1848 about gold in the Sierra Nevada foothills, early-day entrepreneur Sam Brannan cornered the California market on pans, picks and shovels. Without lifting a finger to do any gold mining of his own, he became California’s first millionaire by catering to the needs of the miners. Miners who couldn’t find pans made do with kitchen bowls or whatever they could find. 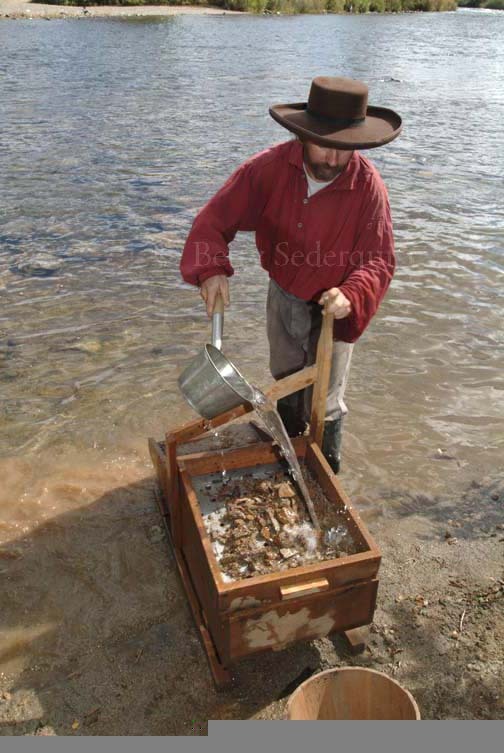 Although gold pans were much in evidence during the early days of the Gold Rush, miners used them less and less as time went on and they created better gold extraction devices. 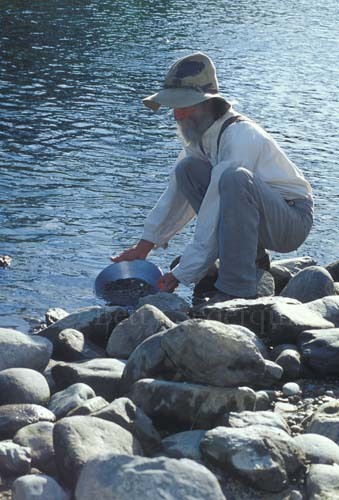 Even today, however, some gold seekers will use the light and simple pans for prospecting, systematically sampling gravels as they work up a stream, for example, and knowing that when the gold “color” stops, a vein or two of gold feeding into the stream may be close at hand. Fortunately for the miners, gold has an unusual quality: it is heavy, and thus all early-day mining processes take advantage of this property. Another popular tool was the rocker or cradle, and indeed, this tool did vaguely resemble a child’s cradle. Using a handle on the rocker to push it back and forth, the miner dumped gravel into the top part and finer and heavier particles dropped through a screen, helped along by buckets of water. The bottom part of the device had slats, or riffles, that caught the heavier metals. After many shovel loads of gravel were pushed through the rocker, the miner would then use his gold pan to sort out the heavy minerals and, with luck, find gold. The long tom was similar in theory to the rocker but was much more elaborate. A paddlewheel ensured a constant source of water. Again gravel was shoveled into the top end and the water pushed it along a long wooden course, sometimes hundreds of feet long. 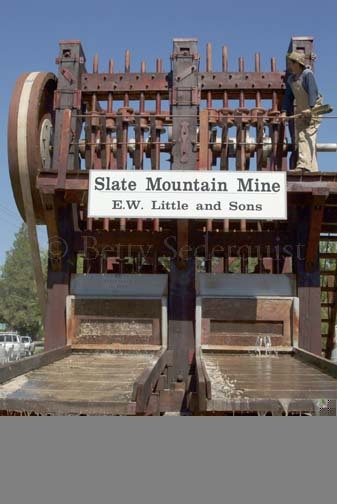 Again, the slats collected the heavier ore, which was then further processed. For these early techniques, water was an essential part of the process. 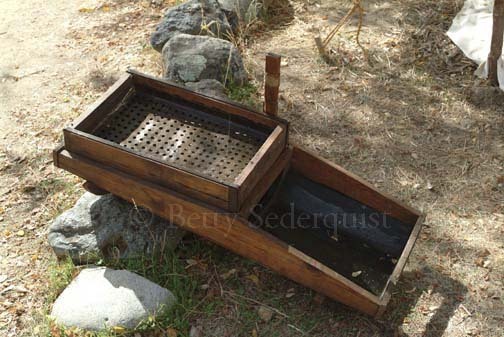 However, since gold was not always found next to streams, miners often had to get the water to where the gold was, and thus elaborate networks of mining ditches were built throughout the gold country; remnants of these ditches can be found even today, and now some are used for agriculture. Miners from Sonoran Mexico had a technique for pulverizing gold ore that required no water for the initial stages of gold processing. Called the arrastre, this system consisted of an upright axle with large spokes. Horses or mules, hooked to the outside edges of the spokes, pulled them around and around. Tied to the interior of the spokes were chunks of gold bearing quartz, which were dragged over a rocky surface and hence pulverized. After the rock was pulverized, the miners then used gold pans for final processing. As time went on, gold mining became increasingly more sophisticated. The solitary gold miner of the 1840s gave way to hundreds of miners toiling in deep hard rock mines, such as those found in Jackson and Grass Valley. In other areas, such as Malakoff Diggins, huge hydraulic hoses washed away entire mountainsides in the search for gold. 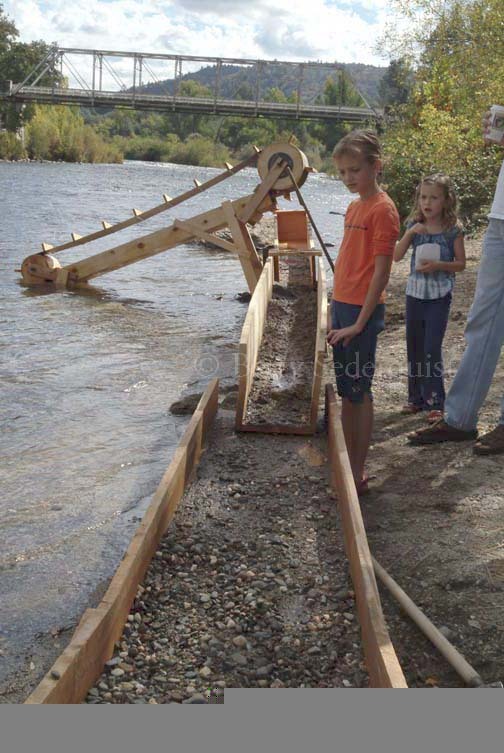 In the flatlands, massive dredgers processed gravels from ancient riverbeds; evidence of this kind of mining can still be found, for example, in and around Folsom, where miles of dredger rockpiles still exist. Ore crushing went well beyond the simple arrastre with the proliferation of stamp mills large and small. The din of these machines could be overwhelming as they pounded quartz into fine rubble. 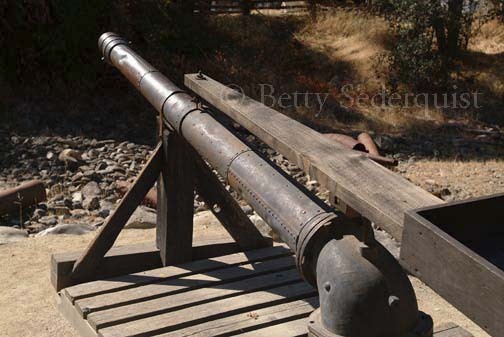 One of the last working stamp mills is demonstrated annually at Founders’ Day in Georgetown, California. Above and below: the rocker or cradle was a simple way of straining gold from lighter rock. 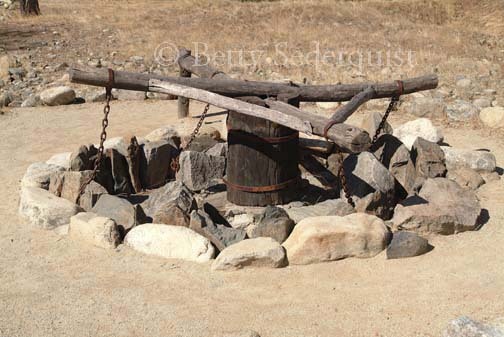 Mexican miners used the horse-drawn arrastre to crush gold-bearing rock. 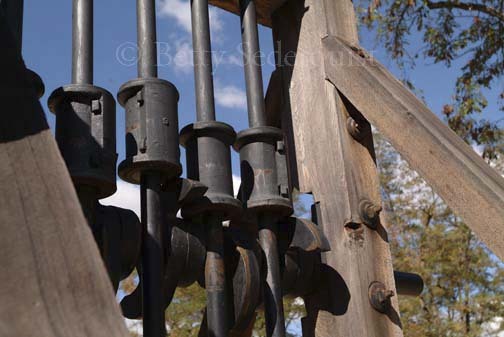 Left and below: Stamp mills were a more sophisticated technique for crushing gold ore. Huge nozzles such as these were used for hydraulic mining. Children view a small long tom at a Gold Rush re-enactment along the South Fork of the American River, Coloma, California.